Drinking water will be supplied to Vellore Corporation and the surrounding village panchayats from the second week of April, according to R. Nanthagopal, Collector of Vellore District. Water will be pumped from the Cauvery River near Chekkanur Barrage downstream of Mettur Dam and treated at a plant at Thottilpatti village near Mettur in Salem district under the Rs.1,295-crore Combined Drinking Water Supply Scheme (CWSS). The Collector, along with School Education Minister K.C. Veeramani, inspected the pipeline, from which Cauvery water flowed from the pipeline into the Palar River, at Venkatapuram, in Pudu Vasur village panchayat near here on Saturday. Talking to newspersons, Mr. Nanthagopal said that the trial run of CWSS commenced on March 26, with the raw water reaching Kodiyur near Jolarpet. “During the trial run, we are cleaning the overhead tanks and the pipelines which have become dirty and silted up. Once the trial run with raw water is over, treated water would be released into the pipelines from Tirupattur up to Vellore, benefiting the people from the second week of April,” he said. The Collector said that when completed, the CWSS would benefit 15 lakh persons in Vellore Corporation, 11 municipalities (Tirupattur, Jolarpet, Vaniyambadi, Ambur, Pernambut, Gudiyatham, Melvisharam, Arcot, Ranipet, Walajapet and Arakkonam), five town panchayats (Natrampalli, Udayendram, Alangayam, Odugathur and Pallikonda) and 944 rural habitations in 14 panchayat unions. 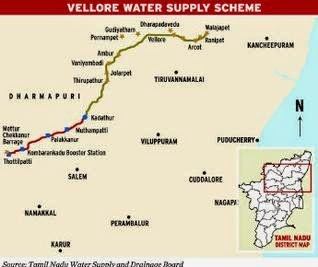 Replying to a question, Mr. Nanthagopal said that treated water would be released only up to Vellore in the second week of April. After cleaning the tanks and pipelines, water would be released to areas between Vellore and Arakkonam 10 days after the release in Vellore, possibly before the end of April, he said. Mr. Veeramani said people of Tirupattur, Ambur and Vaniyambadi have already started using the water released under CWSS after the trial run commenced last week. Asked about the agitation proposed to be conducted by the DMK in Vellore under the president ship of DMK Treasurer M.K. Stalin on Monday to demand the expeditious completion of the works connected with the CWSS, the Minister said that the proposed agitation was a ‘cheap publicity stunt’ of the DMK.